While attention paid to the Israeli geography of imagination, used to configure and dismantle Palestinian territory through the “separation barrier,” has been profoundly significant, what this text addresses is not only the physical border but the cultural and historical borders that [im]mobilize particular identities and social forms. “Why Didn’t You Knock?”. 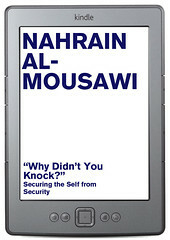 Securing the Self from Security presents the different notions around the "separation barrier" and how it reveals the Israeli geography of imagination, of territorial expansion, of cutting and crisscrossing through Palestinian villages and towns, among other relevant issues. This is the second e-Book of dpr-barcelona's series Emancipatory Space, about politics, economy, law and architecture. This series of e-books intend to spread texts that challenge conventional relations of such subjects.